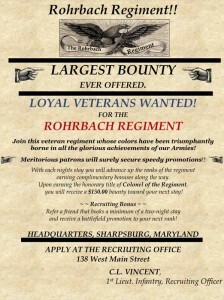 We are pleased to announce our new Guest reward program – The Rohrbach Regiment. Each guest is enrolled into the regiment on their first night’s stay at the inn and awarded with a customized water bottle. This 20 oz. biodegradable sports bottle is ideal for hiking the Antietam battlefield, biking along the C&O Canal with one of our bikes, or just to take along antiquing. After mustering into the regiment as a private, you with advance up the ranks of the regiment with each night’s stay. 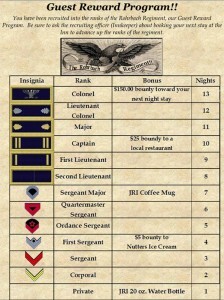 On your fourth night you’ll become the First Sergeant and receive a $5.00 bounty (gift certificate) to Nutter’s Ice Cream here in Sharpsburg. This family owned and operated business offers over 32 flavors of Kemp’s hand dipped ice cream as well as soft served ice cream & other delicious indulgences. By your seventh night you will have gained the experience to become the Sergeant Major of the Regiment and be awarded one of our custom hand-made coffee mugs from Deneen Pottery to take along the campaign trail. After your tenth night you will receive a battlefield promotion to Captain. To celebrate your accomplishment, we will provide you with a $25.00 bounty (gift card) to Captain Benders Tavern just a block from the Inn. Since 1936, Captain Bender’s Tavern has fed the hungry, quenched the thirsty, and served loyally, the historic community of Sharpsburg, Maryland. As a seasoned veteran, having campaigned over thirteen nights with the regiment, you will receive the honorary title as Colonel of the Regiment. 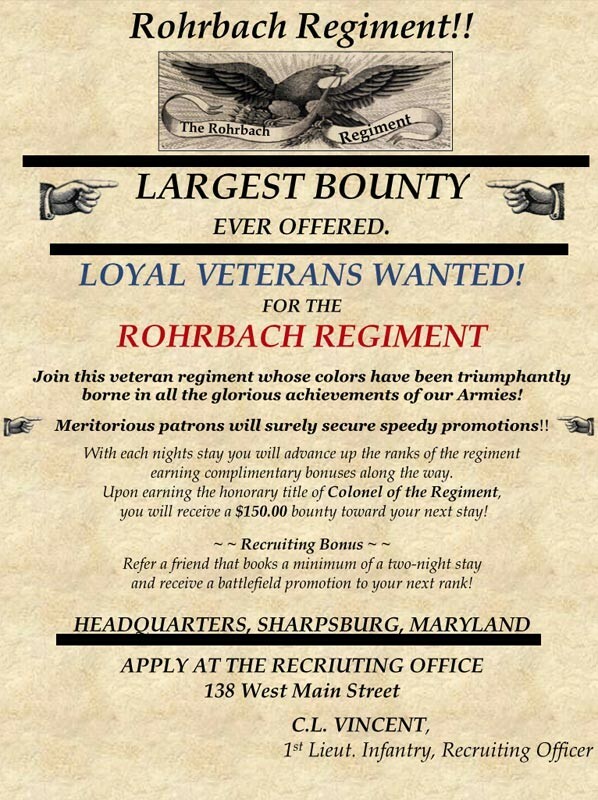 With this honor you’ll collect a $150 bounty (discount) on your next stay here at Antietam’s historic Jacob Rohrbach Inn! Be sure to ask the recruiting officer (Innkeeper) about booking your next stay at the Inn to advance up the ranks of the regiment. 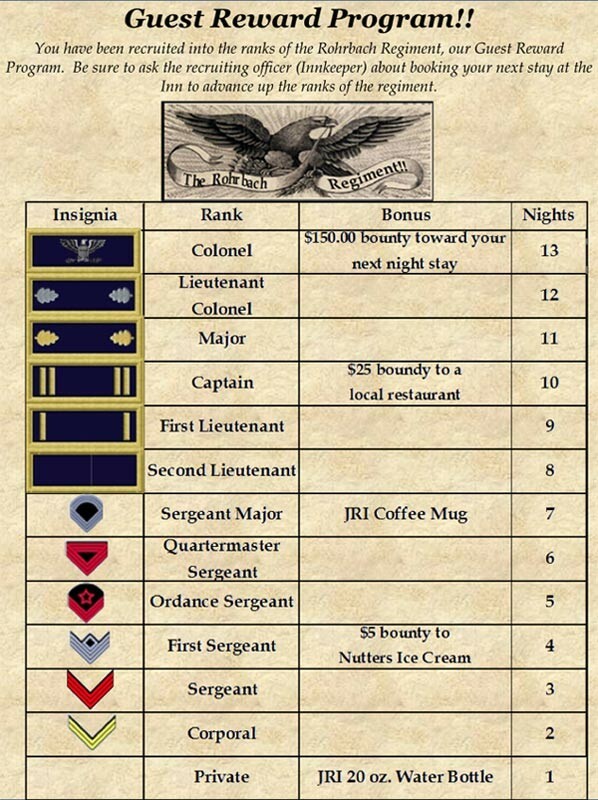 Recruiting Bonus: While you are away from the regiment on recruiting duty at home and you refer a friend that books a minimum of a two-night stay at the Inn you will receive a battlefield promotion to your next rank!